Beginning June 28, people across the country have responded to the united call for national days of action to oppose U.S./NATO and Israeli intervention in Syria. Initiating and endorsing organizations included the ANSWER Coalition, United National Antiwar Coalition (UNAC), United for Peace and Justice (UFPJ), Arab Americans for Peace, Arab Americans for Syria, Veterans For Peace and more. Many prominent individuals also joined the call, including former U.S. attorney general Ramsey Clark; former Congressperson Cynthia McKinney; Akbar Muhammad, International Representative of the Nation of Islam; and Heidi Boghosian, Executive Director of the National Lawyers Guild. Actions took place in Seattle, Boston, Buffalo, New Haven, Chicago, New York City, Los Angeles, San Francisco, Sacramento, Albuquerque, Albany, Syracuse, Vancouver, Minneapolis/St. Paul and more. Below are reports from several of these demonstrations. Demonstrators gathered on July 10 at one of LA’s busiest intersections and public transportation hub, distributing informational leaflets to scores of people taking local trains and busses. A large banner reading “No war on Syria!” was visible to thousands of passing vehicles, with signs of “U.S. out of the Middle East” lining the streets. Many pedestrians passing by stopped and joined the demonstration or took literature with information about the evolving situation. Protestors assembled on July 10 in the heart of downtown, reaching thousands of rush hour commuters and tourists. The action was held under a banner that calls for both freedom for Bradley Manning and no new war against Syria. 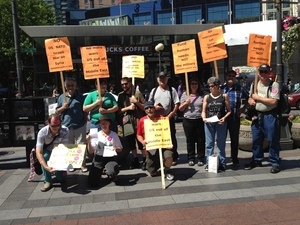 Demonstrators chanted “U.S., NATO, hands off Syria!” and “money for jobs and education, not for war and occupation!” making the link between attacks on vital social services at home and attacks on our sisters and brothers around the world. Speakers from WORD (Women Organized to Resist and Defend), Students for Justice in Palestine, Code Pink, and many other groups addressed the crowd. 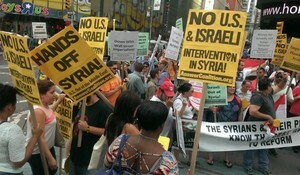 A spirited demonstration was held on July 10 outside the Times Square military recruitment station. Surrounding the building, protesters drew the connection between aggression against Syria and prior and ongoing attacks on the people of Afghanistan, Iraq and Libya. Speakers included representatives from the Syrian community and leaders of Chicago’s antiwar movement, including Midwest Coordinator of the ANSWER Coalition John Beacham. Beacham emphasized the importance of battling the racist justifications for the wars waged on the oppressed peoples of the Middle East and the world as well as the war waged on the workers and oppressed in Chicago, where schools in Black and Latino neighborhoods are facing historic mass closings. The antiwar fighters in Chicago know that the White House and the Pentagon have no “humanitarian” concerns in Syria, but are only driven by imperialist war and plunder. It is only through struggle that the people can shut down the war machine. 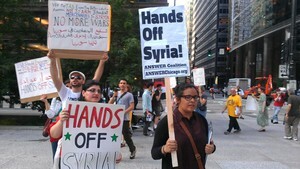 Hands off Syria! 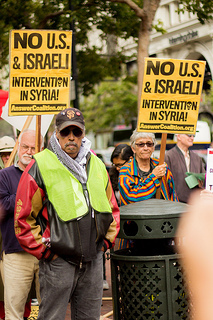 On July 6, anti-war activists came out in Seattle to say No to US/NATO/Israeli intervention in Syria. The action, initiated by the ANSWER Coalition of Seattle, attracted activists from Veterans for Peace chapter 92, Lake Forest Park Neighbors for Peace and the Bradley Manning Support Network. The action drew attention from passersby in the busy Westlake shopping area. Many stopped by the table to sign a petition and get more information. 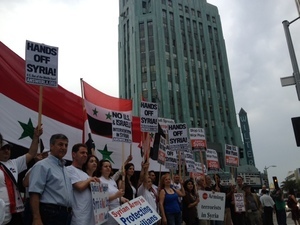 On July 10 activists gathered near the California state Capitol building to take a stand against the U.S./NATO and Israeli war on the people of Syria. Members of the ANSWER Coalition, Veterans for Peace, the Peace and Freedom Party, the Party for Socialism and Liberation and others participated. The crowd held signs against imperialism and calling for peace. Onlookers and passing cars shouted in support and honked their horns approving of the demonstration's anti-imperialist call. People walking by took flyers and literature and and learned about the reality of the U.S. and corporate media's demonization of the Syrian state. Plans were made to have another demonstration against war in the state Capitol soon. Stop the war on Syria!